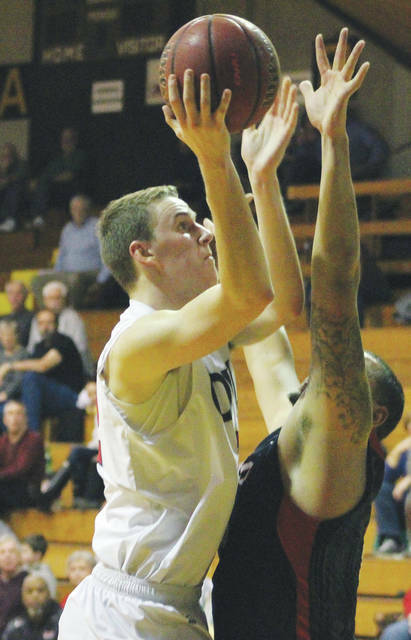 Ohio Wesleyan’s Grant Gossard puts up a shot over Hiram’s Kelvin Jones during the first half of Wednesday’s NCAC showdown at Branch Rickey Arena. Kelvin Jones’ basket underneath with 1:44 left gave Hiram the lead for good, starting a 10-0 run to close the game and hand the Ohio Wesleyan men’s basketball team its second straight loss Wednesday night at Branch Rickey Arena. Jones finished with 21 points and 14 rebounds to lead the Terriers to an 88-79 NCAC victory. Seth Clark knocked down a pair of free throws to give OWU a 79-78 lead with 1:58 left. But, OWU missed its last five attempts from the field and two at the line. Austin Blatt’s short jumper gave Hiram a 71-66 lead with 6:22 left, tying its largest lead of the game. Blatt and Jalen Kirksey finished with 12 points apiece for the Terriers (9-5, 5-2). Nick Heidel’s steal and layup cut the deficit to three and Will Orr was fouled burying a three-pointer and converted a go-ahead free throw to give the Battling Bishops a 72-71 lead with 4:15 left. The teams exchanged the lead seven times over the next three-plus minutes until Jones’ go-ahead basket. OWU used an 18-4 run in the first half to gain control, building a 25-12 lead with 11:30 left in the half. Orr knocked down three three-pointers in the first five and a half minutes and Heidel added two more off the bench to cap the rally. Chris Allocco’s layup with 5:03 left in the first half gave the Bishops their largest lead of the game at 41-26. While OWU was burying threes to the tune of eight in the opening half, Hiram was silent – starting 0-for-8 from long range until knocking down four of the final seven shots. Terrence Warren fed Brevin Dye for a three with 37 seconds left in the half and then hit one of his own to beat the buzzer, capping an 8-2 run that helped the Terriers close it to 47-42 at the break. “I think we gave Hiram a lot of confidence at the end of the first half and that gave them a lot of confidence in the second half,” DeWitt said. A Warren basket and two Paul Ortiz free throws extended the Hiram run to 12-2 in the first three minutes of the second half, cutting the deficit to one. Ortiz had 13 points and Warren finished with 11. Brevin Dye hit a three-pointer and Sherman Douglas III knocked down a jumper to cap an 11-1 run to give Hiram a 61-56 lead with 11:28 left in the half. Clark had 24 points and six rebounds, Orr had 19 points, Heidel had 15 and Axelrod finished with 10 points and six assists to lead the Bishops (10-4, 5-2). Claire Sterling had 20 points and six rebounds to lead Ohio Wesleyan, which came up short in a 67-64 NCAC loss Wednesday night at Hiram. Tia Karras had 16 points and Nicole Popovich had 13 points and eight rebounds for the Bishops (1-14, 0-6). Bri Burgos had 12 points and Allison Vannoy had 11 points, nine rebounds and eight assists to lead the Terriers (7-8, 3-4). Erica Johnson added 10 points and 11 rebounds and Jazmine Scott finished with 10 points for Hiram. OWU continues NCAC play with a trip to Allegheny Saturday afternoon. The women begin at 1 p.m. and the men follow at 3 p.m.